Iris flowers blooming in the village of Gourdon in Provence, France in Europe. The village of Gourdon in the Alpes Maritimes region of Provence in France, can be found 500 meters above the Gorges du Loup. Gourdon is a picturesque little village and the Iris flowers blooming here and there definitely add to its charm. Worldwide there are between 200 and 300 species of Iris, and the word comes from the Greek meaning 'rainbow'. 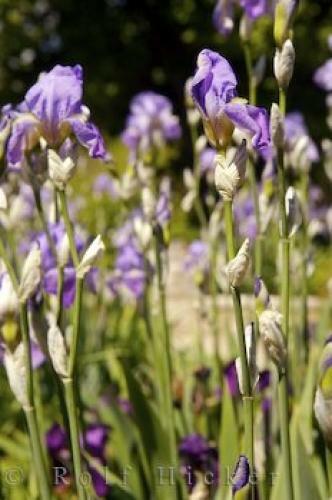 The flowering Iris of Gourdon in Provence, France belongs to an interesting and ancient plant family. In the 12th century King Louis Xll of France declared the fleur-de-lis, otherwise known as the Iris, to be the symbol for France. Iris flowers in the village of Gourdon, Alpes Maritimes, Provence, France, Europe. I photographed this photo with the digital SLR camera model Canon EOS-1Ds Mark II, aperture of f/10.0, exposure time of 1/60 sec. on ISO 100, as always I used a original Canon Lens, the focus lenght for this picture was 70mm.